Review: If there is one retelling that I am to be the most critical with it would have to be any book that claims to be a retelling of my most beloved fairy tale Beauty and the Beast. I have had the chance of reading Stacey Jays Princess of Thorns which was a retelling of Sleeping Beauty and I liked it but didn't love it, so I was a little skeptical going into this one and kept putting it off because I would be fuming if it wasn't anything but stellar. Needless to say, Stacey Jay has written a retelling which will be forever cherished by me. She took the tale of Beauty and the Beast and made it her own. The world was fantastical, there were the smooth skins who lived under the dome where the earth still thrived as long as the queen was sacrificed every so many year's thanks to the curse. On the outside of the dome lived the Monstrous people who had scales and claws who were wasting away in a land where nothing grew. The curse was the most interesting part of the tale, it was definitely different and a lot more depth to it than I had expected. I know the monstrous are supposed to be deemed as the"beast" and the smooth skins as "beauty" but honestly, I didn't feel that was the case. At times I was a bit confused on who was playing what role. The smooth skins are powerful and cruel while the monstrous are only fighting for survival, they wouldn't do half the horrible things that go on inside the dome to their people. Oh, by the way, quite a bit of court politics as well which kept things fast paced. Now on to the two main reasons why I fell in love with Of Beast and Beauty, Isra our smooth skin queen and Gem our swoon worthy monstrous. There was point of views from both characters and I honestly think that is what took this book to a whole another level. Of Beast and Beauty would not have been the same without Gem's view we got a real look into his world and what his people go through and believe me when I tell you it is heartbreaking, his story alone was gut wrenching and I loved him even more than Isra so that's saying something especially when I couldn't help but fall in love with Isra's struggle. It may have been her kingdom but she might as well have been a noble servant because that's how people under her treated her. No one cared about what she had to say, she didn't even have control of her own military, no one respected their blind ruler. The character development was done very well, we saw both Isra and Gem grow as people and get past their prejudices for each other. I also loved some of the side characters they were all exceptionally written and complex. 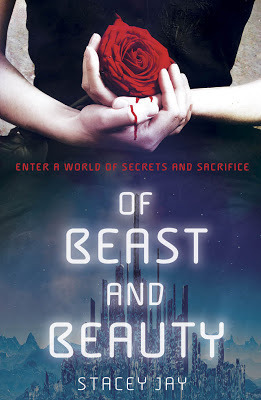 Overall if there is one retelling you decide to pick up Of Beast and Beauty should be it. "I am efficient in my darkness but how I crave the moonlight!"